Scientists can spend years planning, conducting, analyzing, and publishing the results of their investigations. It’s not surprising that trying to design and conduct scientific investigations in a vastly shorter time span, can often be frustrating for instructors and students, and may lead to misunderstandings about how investigations are done. Students’ attempts at quick investigations are often messy, and data can be inconsistent and fairly inconclusive. But scientists often do “messy” exploratory investigations before doing a full investigation. The goal of an exploratory investigation is to observe and record basic patterns in nature, as well as to explore various methods and improve the ultimate design of an investigation. Exploratory studies can be “quick and dirty” but are important to understanding a phenomenon well enough to develop a testable question and appropriate methods for investigating. Similarly, the goal for students in this activity is not coming up with great data, but to observe and record patterns in nature, and to think about how the investigation could be improved in the future. 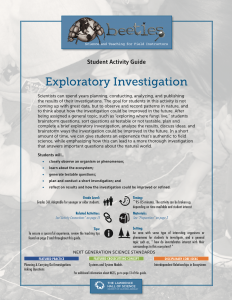 After being assigned a general topic, such as “exploring where fungi live,” students brainstorm questions, sort questions as testable or not testable, plan a brief exploratory investigation, do it, analyze the results, discuss ideas, and brainstorm ways the investigation could be improved in the future. In a relatively short amount of time, we can give students an experience that’s authentic to field science, while emphasizing how this can lead to a more thorough investigation that answers important questions about the natural world. reflect on results and how the investigation could be improved or refined.